Finch decimated the helpless Zimbabwean attack. Zimbabwe and Australia have had contrasting fortunes in their respective opening match. The Aussies came into the event on the backs on a thumping series defeat versus England. 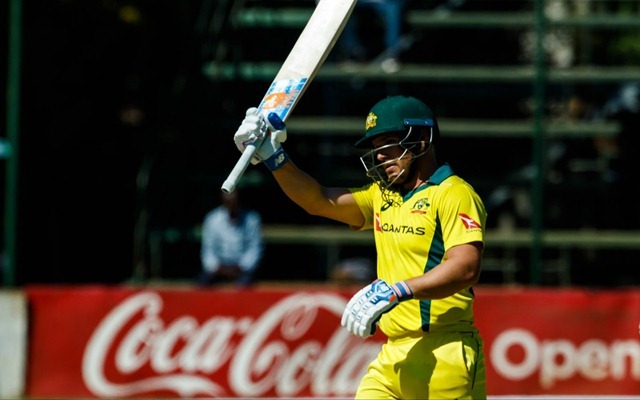 Aaron Finch and his troops needed some individual brilliance in order to turn their fortunes around. It came in the form of a couple of stupendous knocks from Finch, the skipper himself. He scored 84 runs in Birmingham in England’s losing cause versus the Brits. In the first match of the ongoing series, the Victorian played another blinder against Pakistan as he scored 68 unbeaten runs to help his team trace down a modest target of 117. Prior to today’s match, he had an average of 226 in T20Is in 2018. He carried over his form in the Men in Yellow’s next match versus Zimbabwe as well. After the hosts won the toss and elected to field first, Finch unfolded mayhem in the opposition camp. He scored a century in a mere 50 balls after which he threw the kitchen sink at everything. In 2013, the batsman scored 156 runs versus England and today at the Harare Sports Club, he broke his own record to score 172 in 76 balls, a knock which was carved with 16 fours and 10 sixes. Just when it seemed that he would take apart Chris Gayle’s record of 175 runs in T20s, created back in 2013. Unfortunately, he was hit-wicket in the final over off Blessing Muzarabani. D’Arcy Short was his opening partner and both also notched the highest ever partnership of 223 runs in T20Is and the second overall in T20 cricket. The stand was broken by Muzarabani when Short mistimed a pull shot. The Yellow Army eventually managed 229 runs in 20 overs. Meanwhile, Twitter showered praises on Finch as he wreaked havoc. Oh @AaronFinch5 172 off 76… one of the greatest knocks of all time! And selectors wanted you to bat down the order! Always a true opener..
Aaron Finch & D'Arcy Short now on 184 from 16 overs – the highest partnership for any wicket in the history of T20 Internationals. 2nd T20I century for Aaron Finch! Took him just 50 balls. The way aaron finch is batting at the batting at the moment, he could very well be the first batsman to score a double hundred in T20Is. Highest Ever in T20’s … !